In commemoration of the 2019 International Women’s Day (IWD2019), SPACES FOR CHANGE (S4C) and the Communities’ Alliance against Displacement (CAD) convened a Community Women’s Forum, Step-by-Step to Gender Equality, where 60 women and girls living in informal and displaced communities in Lagos State learned about integrated approaches for advancing gender empowerment and gender equality in their homes and communities. 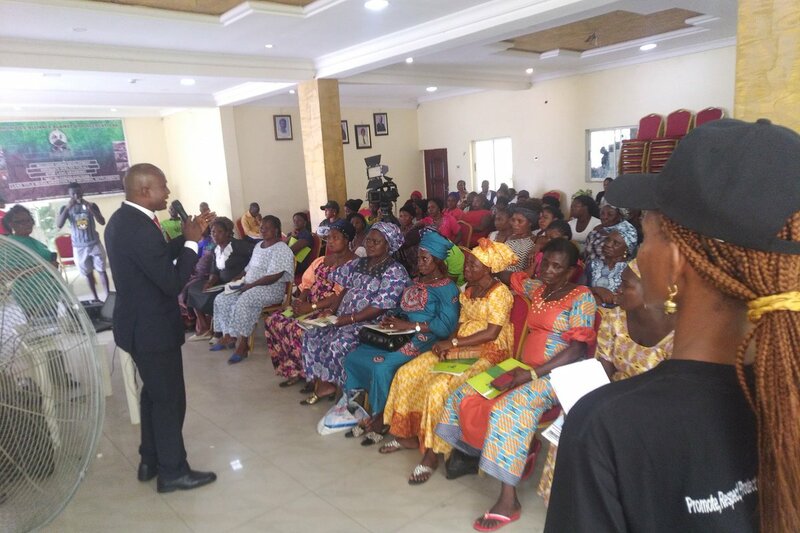 The event held on March 12, 2019, at Oyingbo, Lagos State, keyed into IWD2019’s global theme, “Think equal, build smart, innovate for change.” 60 women living in informal and displaced communities including Itua-Agan, Igbo-Elejo, Oko-Baba, Otumara, Otto-Ilogbo, Apata-Oro, Badia-East, Mowo-Phase2, Isale-Akoka, Ebute-Ilaje, as well as other communities from Mainland, Apapa, Amuwo-Odofin, Eti-Osa, Badagry, Somolu, and Alimosho Local Governments, attended the event. Most of them have experienced recurrent demolition of their homes and business premises in their respective communities, or currently threatened with future evictions. The three presentations at the workshop provided empowering information regarding women’s equal access to micro finance; women’s equal access to housing, public services and infrastructure; women’s equal access to decision-making in the home; and women’s equal access to urban and community development. In the first presentation, Access to Economic Opportunities and Housing Finance for Low-income Women’, Mr. Cletus Ogwuche, Head of Marketing at Chase Microfinance Bank Ltd, discussed different types of loan products for those on low-income or engaged in small-scale economic activities. Target groups could access loans ranging from N100,000 to N1,000,000, payable within 3 to 6 months at first cycle and up to 9 months at subsequent cycles. Women who qualify for such loans include those trading in lockup shops, hospital owners, school owners, people with display goods, etc. Other products available include asset financing of N100,000 to N500,000 which offers beneficiaries economic support to purchase assets such as electricity generator set, television, grinding machine, hair dryer, refrigerator, shop rental etc., among other products. ‘Think Equality Within Low-income Groups’, by Ms. Cynthia Chielotam Ibe of Center for Advancement of Development Rights (CEADER) elucidated how forced evictions disproportionately affect women, taking into account, their traditional role as caregivers or home managers often engaged in businesses in an around the home. Considering women’s central role in the home, they should be included in every dialogue, negotiation, compensation and resettlement processes associated with forced displacement. A number of international and national legal frameworks espouse legal protections against forced evictions. Women must be empowered to claim and assert those rights. Beyond the knowledge of their rights, they must also strive to break the barriers of gender inequality. One way to do this is to be financially independent using the vehicle of quality education, entrepreneurial and leadership skills. During the third session, Improving Women’s Access to Housing, Public Services and Infrastructure, facilitated by S4C’s Aizighode Obinyan, Program Officer on Housing and Urban Governance, participants learned that they can form housing cooperatives to surmount the hurdles associated with obtaining housing finance or mortgages. Another approach is to understand the budgetting process so that they can ensure their concerns regarding community development and infrastructure projects are prioritized in the state budget.